What is this molding and what router bit would reproduce it please? 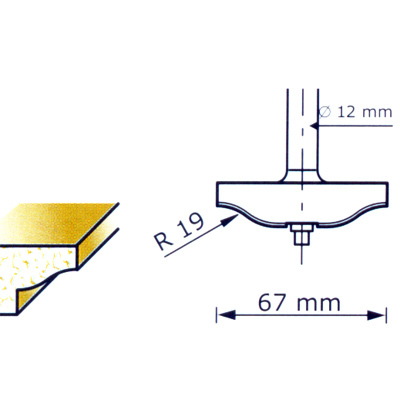 I want to reproduce this molding profile/cut (see pic), but for the life of me after searching Whiteside site and looking at every darn bit (classic and every combination of ogee, fillet, bead, round over, cove) I can't seem to find what this is, let alone what it is called. They have plenty of cheap trim at the big box with the same cut, but I want to put this on my own wood. Re: What is this molding and what router bit would reproduce it please? Also try CMT, Freud, and others. The Freud 99-061 might do the trick. If you run your stock on the side instead of vertically it seems like a close match visually. Different makes do alternative sizes. Some cabinet door moulding cutters use a similar design too. you can try some of the sites listed - some manufacturers provide profiles of their bits. Thanks everybody, that Freud #99-484 looks close enough to me! I'm seeing the same cut on our door and window trim as well (house built in 1890), so the bit could be useful for more than the one project. I do have a few ogee bits, but they are more "circular" in the radius. I was joking with my wife that if I had a $2000 set of hand molding planes I could recreate any profile, though with hours and hours of work! P.S. I need to look at Freud more for router bits. I have almost all Whiteside and they are great, but I have had great experiences with Freud blades on my table saw. IMO your's looks like a custom elongated beading profile. Yes, I have that bit to make some cherry baseboard to match my existing "colonial" baseboard from Homer's Depot. You just have to tweak the height to get the top edge the correct thickness.